“I answered when my name was called and went with the angels to heaven above. 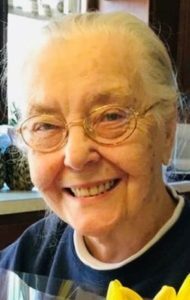 Gertrude went home in peace to be with the Lord on November 27/28th, 2018. Greeting her at the gates of heaven are her husband Julian Stasiak, daughter Christine Maddox (mother of Teresa, Beth-Ann, Juliana, Alexander, Joshua, and Angelica) and son George Maddox (no children). Gertrude leaves behind a beloved daughter Deborah Stasiak-Birkenbine (mother of Katherine), a daughter of Rhode Island, Charmaine Babeiri (mother of Ronald, Thomas, Kimberlie and Danielle) as well as an adoptive son Artie Fitzmeyer of Massachusetts. She also leaves behind a village of great and great-great grandchildren, including the newest addition who she was so proud to have met and held just before her passing, Simon Cole-George (son of granddaughter Katherine). Gertrude felt great joy this past year with spending time with her two best friends Carol and Erna, visiting grandson Thomas of Schuylkill County, the visitation of her granddaughters Beth from Minnesota and Kimberlie from Rhode Island in August, and spending this past Thanksgiving with granddaughter Juliana and her precious family. She would wish for us not to grieve but to cherish the moments we have had, from late night phone conversations, baking extravaganzas, and all hour cribbage games to saying our prayers at bedtime, she loved us all in her own special way. Grandma Gertrude we all love and miss you terribly. We’re going to miss your endless stories and playing cribbage with you everytime you came to visit. Our hearts are aching but we know you finally get to reunite with your husband Julian, Auntie Chris and Uncle George. Our Deepest Condolences go out to the rest of our family.